This project is no longer active. It remains on the website for historical interest. We have received a most generous offer. Between now and July 26th, 2009, any donations received up to a total of $5000 will be matched dollar for dollar. Editor's note: This matching grant has expired. 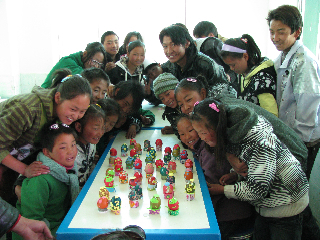 Many of you have been following our fundraising efforts for the Chushul orphanage in Tibet (for information visit http://theoservice.org/node/275 ). I am happy to report that we have just received approval for the building plans from the Chinese government. During the course of this campaign through the generosity of many the TOS has raised over $11,000 – more than enough to complete the original project of building a bathroom/shower addition. We have also been able to substantially broaden the scope of the project by broadening our network. By involving other donors and other organizations we are now in a position to not only build the bath/shower, but we will be upgrading the water system (which regularly froze during the winter), adding a septic system, solar water heaters, and adding a second floor with 3 bedrooms to the existing dormitory. With building set to begin shortly we are still short of our fundraising goal. Indicate "Chushul Orphanage" in the check memo. Thank you.